I had a chance to talk to Commander Greg Harrington of Gramercy Cellars via a satellite link shortly before he and his wife Pam blasted off into the cosmos. Below, we discuss Washington’s recent increase in recognition, the low alcohol movement, the state of syrah in Washington and around the world, and viral videos. See reviews of recent releases from Gramercy below the interview, including notes on the winery’s best Walla Walla Valley syrah to date – quite an accomplishment given the remarkably high bar it has set. WWR: First, congratulations on another great set of reviews from Wine Advocate. Thoughts on the latest issue? HARRINGTON: Thanks, Sean. You know, I think issues like that do nothing but help wine in Washington, especially since its now being done in basically the end of August instead of October/November when it was done in the past. If you look at most of the wines he reviewed, they were 2007 vintages wines, and it was honestly an absolutely stunning, amazing vintage for Washington. The more ninety eight to one hundred point scores we keep getting in Washington, the more we are going to be recognized. We’re still a little bit of the kid brother when it comes to the national wine scene. We’re kind of still in California’s shadow. But I think that in terms of our pricing and the recognition we’re getting and how good the wines are, that’s not going to last too much longer. WWR: Have you seen a change in that in the last few years as there has been more recognition for Washington wine? HARRINGTON: Yeah, when I left New York, I could probably count on one hand the number of restaurants that had Washington wines, let alone a section devoted to Washington wine. Now when I go, I see Washington wine everywhere. I definitely think we are getting more recognition. I think if the economy had been different in the past two years, we really would have just continued to see our sales surge. Look at the high-end wines of Washington and then compare that to the high end of California. Consistently we’re sixty-six to seventy percent of the price, actually less in a lot of cases. WWR: Since you started Gramercy in 2005, the winery has received numerous accolades and awards from Seattle Magazine (Best New Winery), the Wall Street Journal, the San Francisco Chronicle, and Wine Advocate just to name a few. Still, the announcement of receiving "Best New Winery in America" from Food & Wine is an enormous accomplishment. What was your response when you first learned the winery would be receiving the award? HARRINGTON: When we got the call we were actually in Hawaii for the Kapalua Wine Festival. Let’s just say that we had a really, really, good night because we were with about thirty master sommeliers at a wine festival, so it was really fun. But what really was amazing to me was that, not only Washington did it two years in a row, but Walla Walla did it two years in a row in terms of major awards from Food & Wine. I think that’s just an amazing accomplishment for the region, and it’s says that, hey, people are starting to take notice to see what we’re doing here. Walla Walla is a really special place. People help each other and encourage each other's success. I owe a huge debt of gratitude to so many people there - particularly Norm McKibben and Jean Francois Pellet of Pepper Bridge, Jamie Brown of Waters and Justin Wylie of Va Piano. WWR: Did you ever imagine the winery would become this successful this quickly? HARRINGTON: No. Absolutely not. You know, I expected that…It’s funny. Italian Wine Merchants in New York wrote this amazing article. They called it ‘84 points.’ It was about the wines of Bartolo Mascarello and how the wine press just doesn’t get them, and their average score has been eighty-four, eighty-five points. I actually figured that was where we were going to live. I figured I was going to have to beg my friends in the sommelier community to buy our wines, and it was just going to be an uphill battle the entire time. WWR: Are you surprised by how positively the winery has been received both critically and commercially given that the wines are low oak and low alcohol that runs counter to many consumer trends? HARRINGTON: I didn’t expect that at all. Like I said, I honestly I expected to sell this to super wine geeks. You look at wines like tempranillo and even our syrah. The consumer gets it. I honestly don’t understand it, but obviously I’m not going to fight it either. You know I also think that the lower alcohol ‘movement,’ I guess, is coming. You look at producers like Arnot-Roberts or Wind Gap down in Sonoma and some other places in the world, particularly like the Loire Valley. I think that there is a section of the population that is ready for lower alcohol wines. WWR: In your work as a Master Sommelier you do a lot of traveling and a lot of teaching. Have you seen much of a change or shift in terms of the styles of wines either that consumers or looking for or that wineries are producing, either going with more of a lower oak, lower alcohol offering or other types of changes that you have seen? HARRINGTON: I think that a lot of wineries are investigating lower alcohol. There are definitely some people who are doing it, but I think it’s a hard thing for a lot to wineries to commit to because they are afraid to alienate their consumer base. For me, even when we taste our wines, let’s say we taste our wines for ten people. I would say if you have the typical high alcohol cabernet and it’s a really well made wine, eight of out ten people are going to like it. I would say that our response rate is probably a little lower than what the higher alcohol, full bodied, oaked wines get. But what we find is that our customers are like die hard fanatics. We have amazing retention when it comes to our mailing list compared to people I talk to at other wineries. I think when people really appreciate our wines is when they have food. I always tell people that we don’t make wines to sit on the table and just drink and talk about without food. You really, really need food with the kind of style that we make. And that’s where we feel wines’ place is anyway. WWR: We talked about this being the second straight year that Washington and specifically Walla Walla has gotten a major award from Food & Wine Magazine and obviously we have seen other things such as the Wine Spectator ‘Wine of the Year’ last year. What do you attribute Washington’s increase in national recognition to? HARRINGTON: I think it’s about two things. It’s about quality, and it’s about value. Compared to California we’re cheap! There is no two ways to look at it. And I think there are, especially in the media, some of the wine writers are really understanding that it is a place where you can offer balance and you can offer a wine that isn’t seventeen percent alcohol. There’s also a lot of interesting stories going on in Washington. There’re a lot of characters running around here. There’s also a lot of really, really serious people moving to the region to make wine. 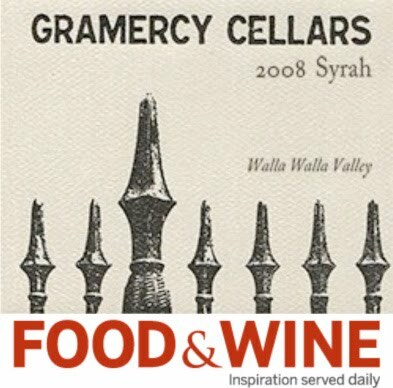 WWR: Gramercy has really been successful despite or really in fact because of its syrah at least in part. Syrah has become somewhat of a dirty word in Washington in the last few years. A lot of wineries came out with multiple different offerings, which many had a hard time selling. Why do you think that is? HARRINGTON: I think it’s a two-part answer. One, I think consumers are really, really confused about syrah. No other varietal is really as amenable to different climates and winemaking styles as syrah. At least I can’t think of one. In a way it really is the Chardonnay of the red wine world because you can do so many different things to it. You look at what’s done in the Northern Rhone and you get one style, which is higher acid and black meat and black pepper. Then you go to Australia and you look at what they do which is basically blueberries and plum compote and vanilla. And the two styles couldn’t be more apart. Then you look at what California has done and what Washington has done. We have more of a distinct style, which we can talk about in a second. But I think the general consumer is confused and they say to themselves, what really is there difference between a $20 bottle and $150 bottle and what am I getting when I buy those wines? I think a lot of people are really, really unsure of what they’re getting. Secondly, I think Jay Miller summed this thought up really well in the bottom of his article about Washington when he said you can’t make syrah like you make cabernet. It’s a grape where you really have to forget everything you know about cabernet making or Bordeaux varietals and do something exactly different. You have to pick it early. You have to pick it before it gets good in the vineyard. It’s going to go a little green in the fermenter. You can’t freak out. You just have to be really patient with it and treat it more like Pinot Noir than anything else. I think a lot of winemakers really have difficulty making that adjustment. I think it was kind of beneficial to me that I didn’t have any winemaking experience when I started because it wasn’t really that much of a stretch to do different things for different varietals. WWR: Despite the fact that some wineries here are struggling with syrah, you have obviously done quite well with it. Still the grape has gotten widespread critical acclaim. What do you think it is that makes Washington syrah special versus some of the areas we’ve talked about? HARRINGTON: It’s kind of our hometown varietal for lack of a better definition. I think what really stands out for syrah is, structurally you might get different styles of wine within Washington but aromatically and taste profile-wise there is a vein of consistency that runs through all the regions. If you compare Walla Walla syrah to Red Mountain syrah to Yakima syrah there is this vein of blueberry, black pepper, and smoked meat. Obviously you are going to find it at different ripeness and different intensities. ‘Rocks’ syrah is going to be more bacon and black pepper. Red Mountain is going to be much more on that blueberry side. But I think the consumer needs to understand what they are going to get. I think that is really the uphill battle for syrah. To me that’s the only reason that I can think of. When you have these wineries that are getting such critical acclaim, it’s a varietal people really can’t afford to ignore. WWR: Despite the fact that a lot of people – there’s been jokes about the differences between a case of syrah and a case of pneumonia etc – I do believe that the grape has a strong place here and that you can’t ignore how good some of these wines are. Personally, I expect it to continue to thrive and do well here although, that said, there will also be a lot of syrah out there that will probably away. HARRINGTON: It’s funny because it’s a grape that you can’t make mediocre. You either have to be in the super, super geeky, quirky high acid style that we do or you have to be Sine Qua Non or Cayuse and K. You really can’t be in the middle. Unfortunately, syrah is a really good grape to make mediocre. I think you really have to have a goal in mind when you make syrah, much more so than some of the other varietals that are planted in the world. WWR: Switching gears a little, it’s hard to believe at this point that it’s going to be the wineries fifth vintage coming up with this harvest. How has your approach to winemaking changed over the last five years or so? How has your thinking changed? HARRINGTON: I’m not scared to death anymore, that’s for sure. I think, regarding wines, I think the biggest change for me has been working in the vineyard and working with the growers, and I think most importantly is I trust my gut when I think the picking decisions should be made. I’m not waiting for other, more well known wineries in the vineyard where we might be sharing blocks to pick their grapes. If I decide that a syrah block needs to get picked two weeks before, I‘m going to pick it, and the same thing with all of my other varietals. Number two, you know, if you investigate the great winemaking techniques of the world and study what the great winemakers do, it’s really interesting that those techniques work in Washington. You can look at what a guy like Rostaing or Jamet do in Cote Rotie, and then do it in the winery in Walla Walla, and it actually works, which I know for a lot of varietals when you bring them to the new world those methods don’t necessary work. Particularly with syrah, things like stems and whole cluster fermentation and not racking it. It’ll actually work. And then I think that when we make up the wines every spring, I’m not afraid to leave something out of the blend if it doesn’t fit. We declassified a lot of wine in 2008. My wife has been really supportive of this. We realize we’ll make a little bit less revenue wise, but we’re going to put the best wine on the market that we can. If it doesn’t work, I’m going to leave it out of the blend. WWR: One of the things that’s been interesting for me to see is that in the last few years I’ve noticed more and more winemakers particularly in Walla Walla experimenting with using stems in the fermentation, and I think that’s something that your winery has had a significant influence on that’s been interesting to see. Changes that you’re planning or things that are going on at the winery at this point that you’re excited about? HARRINGTON: A couple things. In terms of the lineup, we’re pretty much set. You know we may have some little one-off experiments. I have some Mourvedre in barrel right now that should probably be bottled on its own. I’m really, really happy with the lineup of wines. I don’t really want to be a winery that makes seventeen wines. With six I think we’re pretty much at a good place. We’re about four thousand to forty-five hundred cases a year. One thing I am really excited about is, starting this year, I have Red Willow syrah which I think that wine may have to be our first single vineyard wine. I’m really, really excited about that. Believe it or not we have a tasting room coming. I’ve been resisting and resisting and resisting. We had a chance to take over the old Amavi building, so we’re basically going to kind of reinvent the way tasting rooms are done in Washington and make just a really cool place to hang out. People can come by and we’ll have a kitchen and we can do dinners for people. Basically just a fun place for us to hang out. WWR: When are you expecting the tasting room to be opening up? WWR: Gramercy has been very active in Social Media particularly in the area of viral videos. Can you talk a bit about the inspiration for that, the first one you made, what the response has been, and how that has impacted the winery? HARRINGTON: That video was actually really an amazing surprise for us. If you look at our entire marketing, we kind of take this irreverent, tongue-in-cheek attitude toward the way wine is marketed and the way we market wine. Obviously it’s our passion, and it’s basically the only thing I’ve ever done my entire life. But I think a lot of winery marketing is just really kind of boring and just not fun. So we try to make our newsletter something that people want to read and not take ourselves too seriously when it comes to selling our wine. And with that video I was kind of testing the waters. I’d seen some of the other movies that had come out with that program, and I said, ‘Maybe this would be a fun thing to do to fool around’ that was kind of the result. But if you notice, we never said Gramercy in the video, and I didn’t put any website links to it because I honestly wasn’t sure if the general public was ready to accept winery’s marketing themselves that way, particularly wines $40 to $50 a bottle. But the success of that video literally changed the way we market the winery. We actually have another video coming the day the Wine & Spirits award is announced. WWR: Finally, given the Food & Wine magazine award, any plans for a billboard in the Walla Walla area? HARRINGTON: (Laughs) Yeah, we are going to take a billboard. "Balanced Wines. Balanced Minds." WWR: (Laughs) Well thanks Greg. I appreciate the opportunity to talk with you. HARRINGTON: Thank you. (Audible sound of engines accelerating in the background as the line goes dead). Rating: ** (Exceptional) Intensely compelling aromatics marked by violets, sliced black olives, light game, and purple fruit. A richly textured palate with an almost gauzy mouthfeel that also boasts outrageous fruit intensity. The finish goes on as long as you want to count. The best Walla Walla Valley syrah from the winery to date. 100% Syrah. Les Collines Vineyard. 480 cases produced. Rating: ** (Exceptional) Red fruit, earth, and spice on a nose that is still somewhat closed up. Big and rich with luscious red fruit flavors that coat the palate. A bit of a departure from the house style in some respects - this is a bigger, bolder wine - but delicious all the same. 60% Grenache, 20% Syrah, and 20% Mourvedre. Alder Ridge, Minick vineyards. 330 cases produced. Rating: ** (Exceptional) An intoxicating, drop dead gorgeous nose with game, floral notes, and orange peel. The palate is breathtaking and intricately layered with an incredible purity of fruit paired with a richly textured mouthfeel. A zing of acidity runs through the wine. 200 cases produced. Syrah co-fermented with viognier. 13.9% alcohol. 200 cases produced. Rating: ** (Exceptional) A richly aromatic wine that opens up with high toned black fruit, a touch of mint, light chocolate, pencil shavings, and licorice. The palate is rich but restrained with a textured mouthfeel. An emphatic example of Washington State Cabernet. 13.9% alcohol. 650 cases produced. Rating: */** (Excellent/Exceptional) Abundant pencil shavings, savory notes, sweet spices, and red fruit on a nose that is somewhat closed at present. A very pretty texture on a palate marked by red fruit and vanilla. Among the best being produced in the state. 90% Tempranillo, 6% Syrah, 4% Mourvedre. Aged 15 months in American oak. 693 cases produced. Note: The original post tagline listed the award from Wine & Spirits (incorrect) instead of Food & Wine (correct). This was subsequently fixed. References to the award in the interview were correct and unchanged. "You know we may have some little one-off experiments. I have some Mourvedre in barrel right now that should probably be bottled on its own. " CindyW, a good number of people quite excited about Mourvedre in Washington right now. Still very much a niche wine here but one to keep an eye on. Thanks for the comment. What a great interview! As fans of Waters, we discovered Gramercy through that relationship, and in doing so found another great producer of wine. While it's awesome to see these wineries get the recognition that they deserve, a part of me wishes that we could somehow keep them "our little secret". As always Sean, you do an excellent and thorough job of investigating a topic. And kudos to Gramercy for their meteoric rise to national attention. The recognition will help the entire state of Washington.